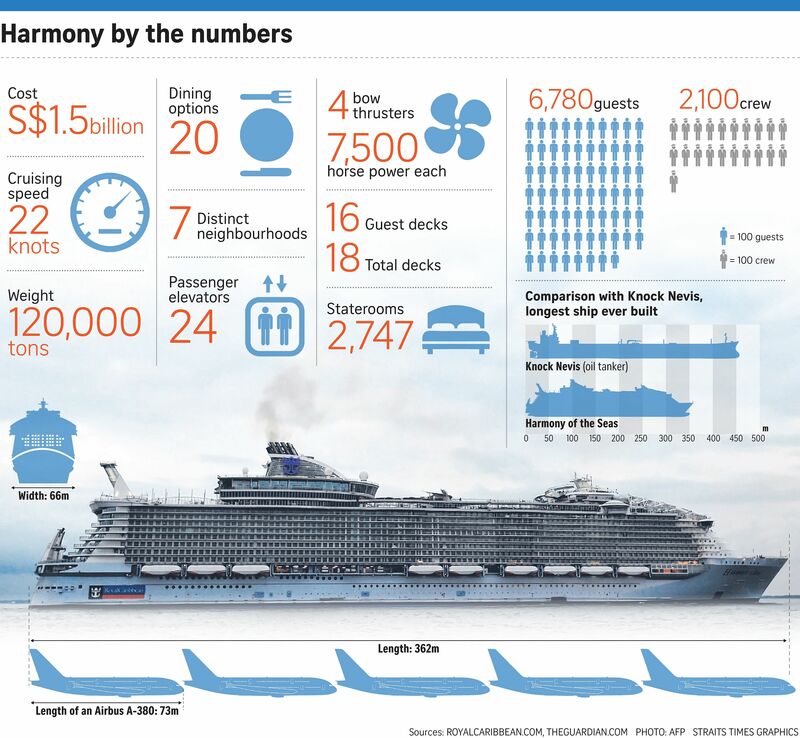 SAINT-NAZAIRE • Tens of thousands of people turned out in France to see off the world's biggest cruise ship, the 120,000-ton Harmony of the Seas, as it set sail for the first time. At 66m wide, it is the widest cruise ship, while its 362m length makes it nearly 40m longer than the height of the Eiffel Tower in Paris. As the massive vessel pulled away from a shipyard in Saint-Nazaire on Sunday, where it was built on France's Atlantic shore, some 70,000 people watched from along the coast, the local authorities said. The crowd waved, cheered and clapped as the mega ship - built for the United States-based Royal Caribbean Cruises - eased away from its berth in France. "It is gone," said Ms Christine, who did not give her full name. "We watched it develop and grow over three years. It is like a child leaving home." The floating town, which cost close to €1 billion (S$1.5 billion), has 16 guest decks and will be able to carry 6,780 passengers and 2,100 crew. It took 2,500 workers at the STX France shipyard around 10 million work-hours to complete the enormous vessel after work began in September 2013. The ship is headed for Southampton in southern England and is to embark on its official maiden voyage on May 22 to its new home port of Barcelona.